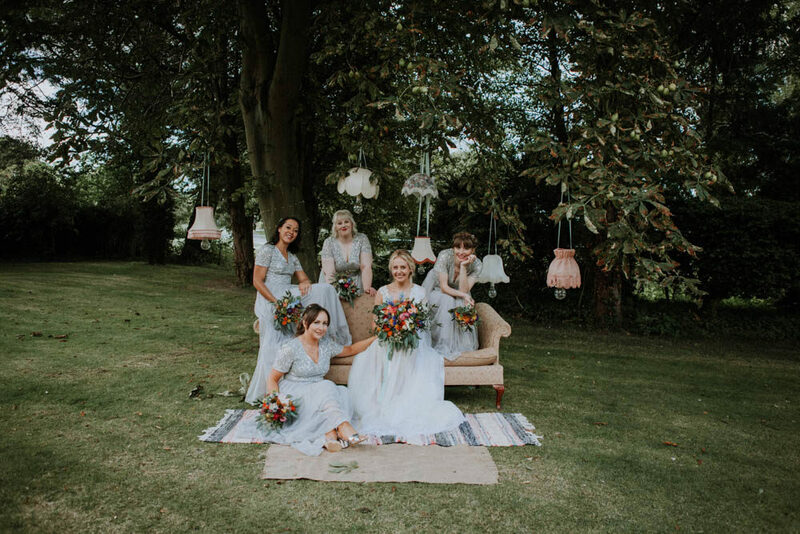 Make sure you’re sitting comfortably folks as this DIY rustic wedding captured beautifully by Meghan Lorna Photography deserves your undivided attention. 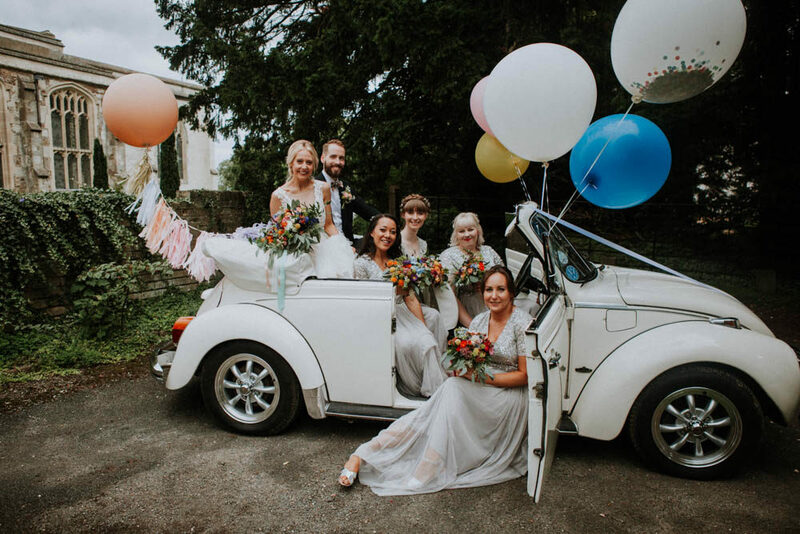 The charm of this colourful wedding began long before the date the bride and groom said I do. Their personality and individuality started unfolding when they sent out the invitations with a marrow seed. They requested all guests nurture their seeds and bring their offerings to the reception for a best in show competition. Some of them are mighty impressive. 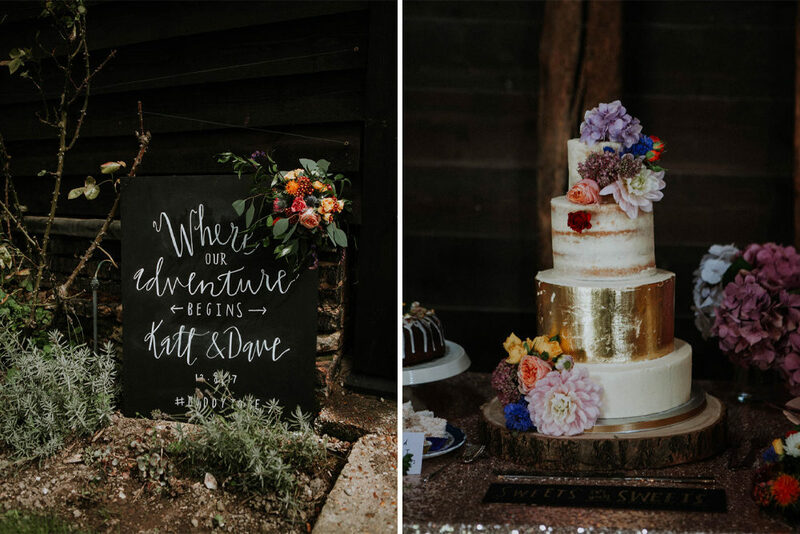 Bride Katt also hand painted portraits of guests to sit at their place setting along with a spray painted dinosaurs, and the church and reception are full of fabulous florals and signs. Now are you ready to be inspired? Probably best to get those pinning fingers at the ready too. Enjoy. Katt the Bride: We met at university in Nottingham, where we were both on the same course studying Graphic Design. We have lived together since university, in London for 6 years and then in New York in 2016. David proposed on a romantic, surprise trip to Florence and with lots of planning and logistics, Two years and one week later we were married! 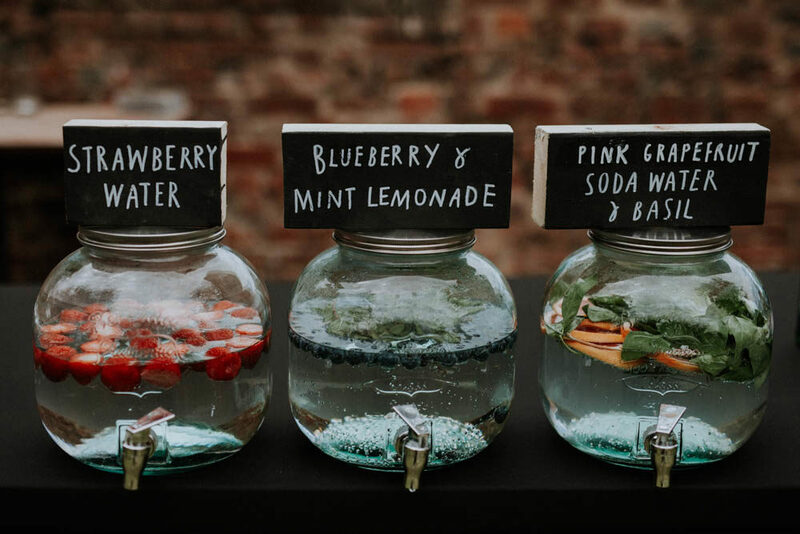 We always knew the type of wedding we wanted, fun, and with tonnes of personal touches. We’re both very creative and love a challenge. Along with our amazing, hard working close friends and family we totally pulled it off. With me being an illustrator and designer, we knew we would be designing and making things most things. We did everything from signage and seating plans to ceremony materials, games and photobooth props. Collectively we are both drawn to randomness so we purposefully didn’t subscribe to a colour scheme. My wonderful Mother spent a year making bunting from various fabrics we’d hoarded over the years, from clothes to bed sheets. 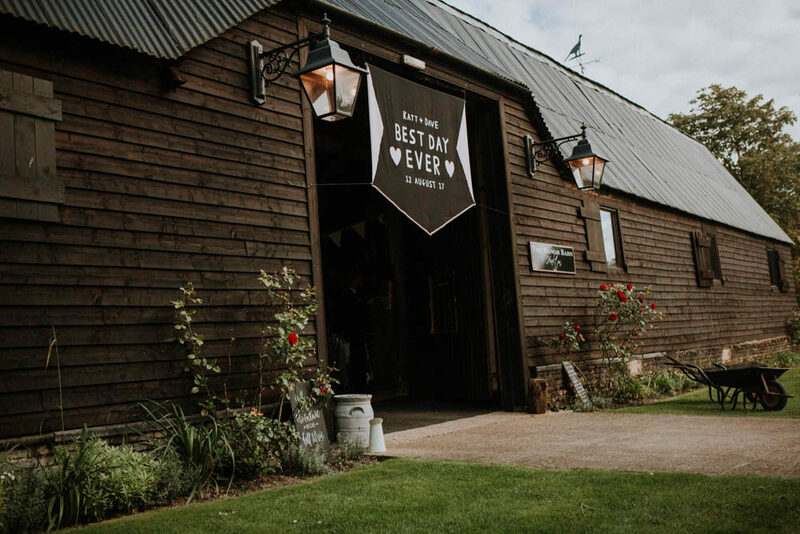 One of our bridesmaids – Emma Denby, designed and handmade the huge wedding banner for the entrance to the barn as a gift to us. We bought and customised a lot of furniture from our favourite Charity shop in Nottingham, (with the majority of pieces being donated back to them afterwards). We bought lampshades to decorate the trees in the garden and painted old sideboards for a gift table and writing desk. We also decided to hire some larger items like sofas to create more informal settings for the family photographs. 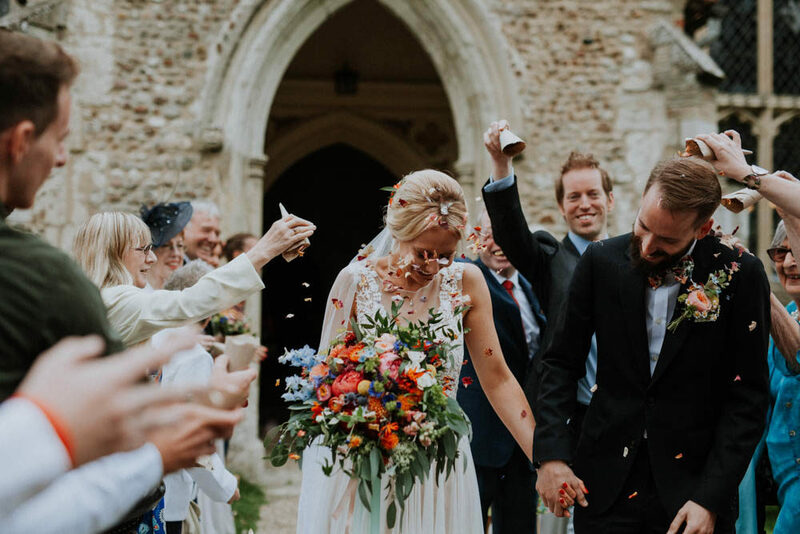 We wanted our photos to be far from ordinary, and early on we had a vision to see our guests dressed in their wedding best carrying home grown vegetables to the church. So with our invites we posted little packets of marrow seeds with a note saying that there would be prizes handed out on the day, for the ‘Best-in-show’. We thought that it would be fun for our Grannies to judge it. 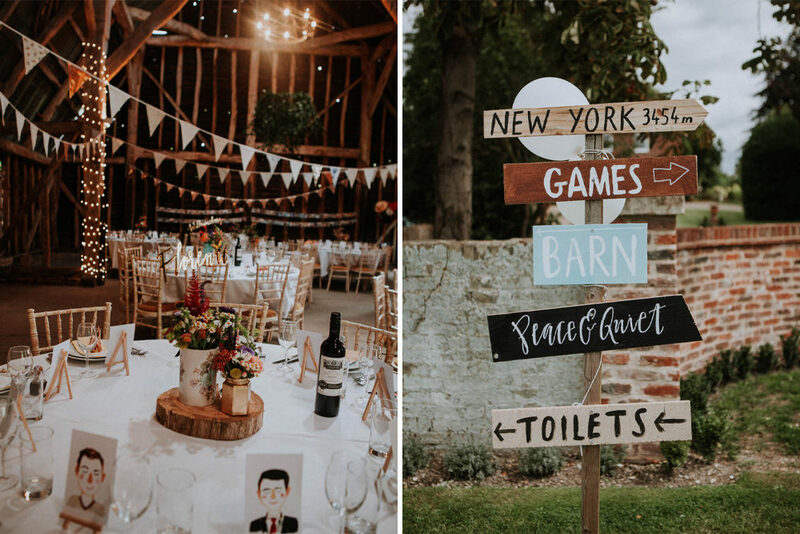 We must have looked at around 30 venues in and around London before we saw The Manor Barn. When we visited the barn we instantly fell in love. A major plus was Jen, the venue coordinator. Her experience and dedication was wonderful, and she was totally on board with all our strange requests from the outset. The barn was also right next to our lovely little Church, which is so beautiful, both inside and out. During the ceremony we had readings by two of our good friends, Chris & Lucy, one was a religious reading, and the other, a poem ‘I Like You’ from the Children’s book by Sandol Stoddard Warburg. We both love plants and flowers, they’re a huge part of our life together! So this was one thing we were not willing to compromise our budget for. 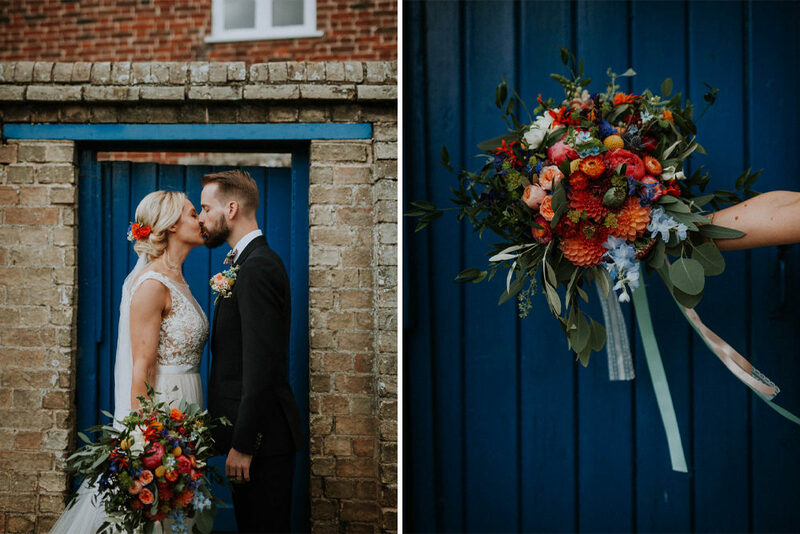 I knew that I wanted my bouquet to be big, bold and beautiful and it was just that. David (keeping his suit a surprise for the day) came along after the bouquet flowers had been picked and used it as his inspiration for the button holes. Dawn, our florist, also created an 8 meter swag of foliage and flowers for the archway under which we were married. For the top table and table centers we added various vases and pots that we’ve collected during our relationship – mixing various heights with the bright, mixed flowers. I hand wrote the table names, which were laser cut out of gold acrylic. I actually ended up having a very stressful time with my dress. I tried on over 100 dresses in total, eventually settling on a vintage dress. In the run up to the wedding I was regularly flying back to the UK and having fittings, and all was going well until 10 days before the wedding the lady who was altering it, messed it up. I went into melt down and had no idea what I was going to do. Being in Nottingham at the time I quickly Googled dress shops and just drove to Carla’s Brides, not feeling too optimistic. Through some strange, chance encounter, there was only one dress in the shop I liked. Carla, the owner, had accidentally ordered it in the wrong size for the shop a year ago and had just kept it in the back, it fitted perfectly and needed no alterations with the exception of a bustle, and so, that was that. David decided to keep his look classic and refined with a dark Navy Blue suit by Paul Smith, cut with a double vent and half break in the leg, braces by Albert Thurston, Derby Brogues by Coach, a vintage brushed gold ring and a bespoke bow tie in vintage Liberty fabric by Bunny Bosworth for a subtle twist. My four closest friends from my hometown of Nottingham were my Bridesmaids. They wore dresses and shoes both from ASOS. We added personalized jewellery. Hair and make up by the wonderful, Karen Starr. Our evening entertainment was this amazing band called ‘The Highliners’. They did two fantastically energetic sets, and also DJ’d for us at the end. They learned new songs to play live for us, including ‘We are Scientists’, Nobody move, nobody get hurt, it’s one of our favourite songs. It totally pushed them out of their comfort zone, but they nailed it. It was a real highlight of the evening. From the moment that we met Meghan and Andy we knew that we wanted them to shoot our wedding, it was like we’d known them for ever. We love Meghan’s photography style, and every shoot we had with them was so much fun. They both have brilliant personalities, enough to make you relax and enjoy yourself. We decided to make a photobooth for the evening, so we could have some more relaxed photographs. Continuing with the plant vibes, so sourced some jungle wallpaper and bought some props from charity shops. We got a local photographer to take the photos. We served our cake as the final course of the meal (made by the talented Anne-Louise of Sugar B Cakes). 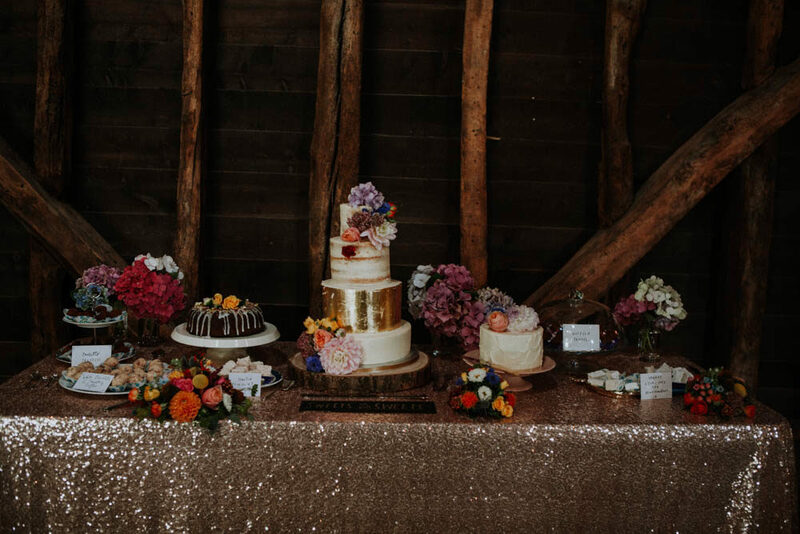 She created a tall semi-naked cake with gold leaf accents for us in three flavours; Pistachio and Rose, Morrell Cherry and Almond and double Chocolate. We didn’t want the evening guests to miss out, so we also had a Cherry, Fig and Date bundt cake alongside truffles and marshmallows all made by me and my bridesmaids. We’re really glad that we managed to get so much of our spirit weaved throughout the day. The personal touches gave us real moments to savour in a day that went past in a flash but we’ll remember forever. 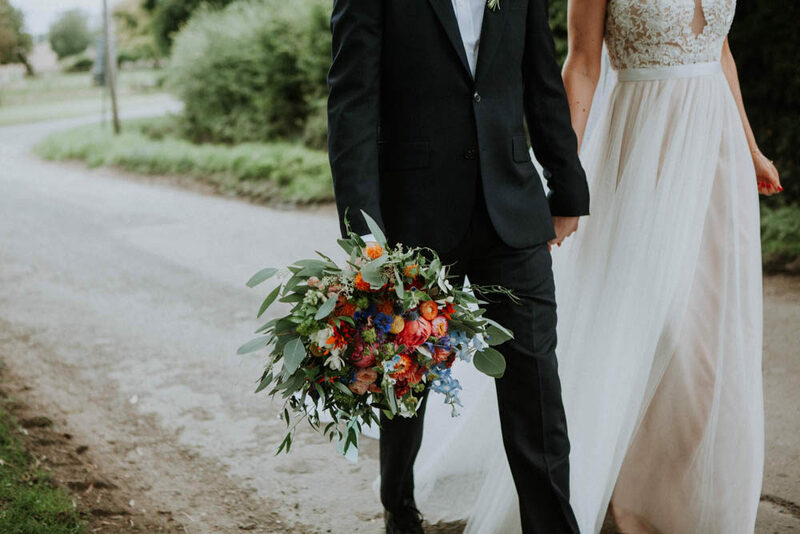 Love the bridesnaid’s PJ bottoms, does anyone know where they’re from? Love, Love just love the stunning pictures. The bride and bridesmaids look fabulous.